Emphysema is a problem with the tiny air sacs that make up the lungs. These sacs should stretch to fill with air and get smaller as air moves out of the lungs. Emphysema is when the air sacs are damaged. It makes it hard to breathe. 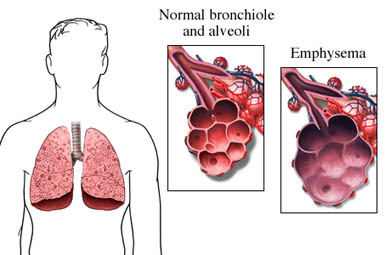 Emphysema is a type of chronic obstructive pulmonary disease (COPD). There is no cure. 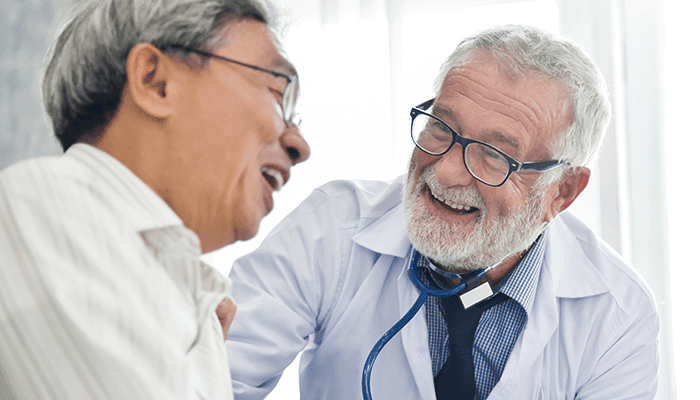 Your doctor will focus on helping you manage symptoms and improve your quality of life. Limit the number of irritants in the air you breathe. Avoid smoke, dust, smog, extreme heat or cold, and high altitudes. Some medicines may be taken as pills or liquids. Others are inhaled medicines that are delivered directly to the lungs. The flu and pneumonia can make your symptoms worse. Get vaccinated against pneumonia and the flu . The flu vaccine may also reduce flare-ups. Oxygen therapy may be helpful if the oxygen levels in your blood are too low. It can help you breathe and improve your level of energy. You may only need it for specific activities or it may be given throughout the day. Special exercises can strengthen chest muscles. This can make it easier to breathe. Regular physical activity can reduce how hard your lungs work by building up endurance. 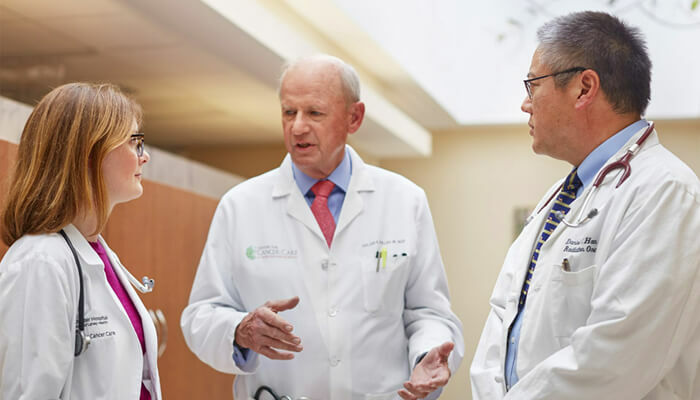 Follow your doctor's advice about what is right for you. Eat a healthy diet. It should be low in fat. It should also be rich in fruits, vegetables , and whole grain foods. Try to stay at a healthy weight. Extra weight causes the lungs and heart to work harder than they need to. It may be hard to eat because you feel full. Try eating many smaller meals during the day instead of a few large ones. Eat slowly. This will make it easier to breathe. If you need to gain weight, add food or drinks during the day. Talk to a dietitian about how many calories you need in one day. Learn relaxation methods and other ways to manage stress. Get support from therapists, family, and friends. Anxiety can raise your breathing rate. A small number of people may benefit from surgery. You may need to have a part of your lung removed. Or you may need a lung transplant . COPD. American Lung Association website. Available at: http://www.lung.org/lung-disease/copd. Accessed August 28, 2018. COPD. EBSCO DynaMed Plus website. Available at: https://www.dynamed.com/topics/dmp~AN~T115557/COPD . Updated August 13, 2018. Accessed August 28, 2018. COPD. National Heart, Lung, and Blood Institute website. Available at: http://www.nhlbi.nih.gov/health/health-topics/topics/copd. Accessed August 28, 2018. COPD and asthma. National Lung Health Education Program website. Available at: http://www.nlhep.org/Pages/COPD-and-Asthma.aspx. Accessed August 28, 2018. Emphysema. American Lung Association website. Available at: http://www.lung.org/lung-disease/emphysema. Accessed August 28, 2018. Petrache I, Diab K, Knox KS, et al. HIV associated pulmonary emphysema: A review of the literature and inquiry into its mechanism. Thorax. 2008;63(5):463-469.